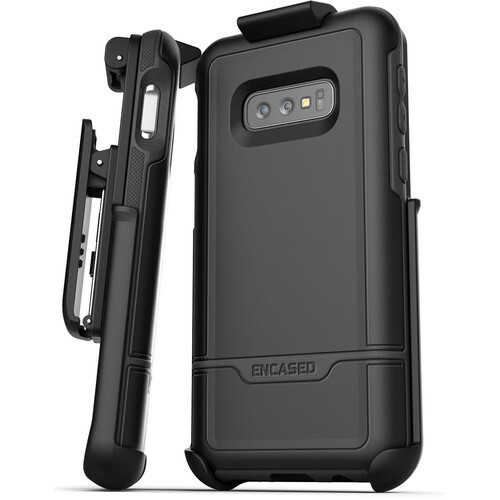 Keep your Samsung Galaxy S10e protected and within reach with the Rebel Series Case with Belt Clip Holster from Encased. This case offers all-in-one protection with an impact-resistant outer frame and sure-grip TPU sub-frame. The raised lip guard is designed to keep the screen recessed and out of harm's way. Get full access to all ports and jacks thanks to the precision cutouts, while the easy-push buttons retain the S10e's responsive button click and feel. This set includes a secure-fit companion holster. The belt clip features a solid-core polycarbonate frame with a non-slip rubberized grip finish. The inside of the belt clip holster has a soft microfiber lining to add protection for the inward facing screen. The secure-fit top locking design makes mounting and dismounting the S10e simple. In addition, the built-in kickstand gives you a convenient, hands-free viewing solution. With the rotating belt clip holster position your phone in either a vertical or horizontal position. This Rebel Series case is designed to work with most wireless chargers. Box Dimensions (LxWxH) 7.7 x 3.9 x 0.7"